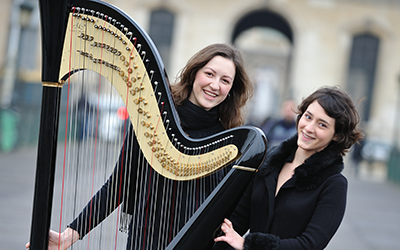 Based in Paris, timeless source of artistic inspiration and cradle of the modern harp, the Atlantic Harp Duo originally built their repertoire on a foundation of pieces by French composers and harpists. The wealth that is contained within the French classical music tradition is particularly well expressed through the colorful sonority of two harps. This program is a balanced mix of works originally written for two harps, as well as masterful transcriptions of other French favorites, which brings to life the atmosphere of 19th and 20th century France.